Size: Up to 6" (15cm). Compatibility: Normally quite peaceful, but may become territorial with other gouramies or similar fish. Feeding: Omnivorous, most foods accepted - feed flake and granular foods, supplemented with frozen/live foods. 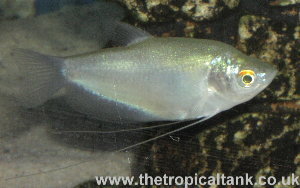 Sexing: Pelvic fins of males may show orange-red colour, in females it is yellow. Breeding: Bubble nest builder. The male will care for the fry for the first few days. Comments: Although not as colourful as other members of the genus, this is still a striking fish. A well planted tank with other peaceful and slow-swimming species is ideal.